Image of a yet to be installed Ocean Renewable Power Company underwater TideGen turbine in Eastport, Maine Monday, July 23, 2012. PORTLAND, Maine — The Portland-based Ocean Renewable Power Co. made North American history in September when its 176,000-pound tidal-power generator pumped electricity from Cobscook Bay to a commercial grid for the first time. Next year, alongside expanding its Maine project into the Bay of Fundy, ORPC plans to make history again by placing a scaled-down version of its pioneering turbine in the Kvichat River, next to the 66-person Alaskan town of Igiugig. The company received a $1.5 million award for the project earlier this year from the Alaska Energy Authority’s Emerging Energy Technology Fund. Scheduled to start next July, the project will be the company’s first test of its turbine designed for rivers, which John Ferland, ORPC’s vice president of project development, says will open markets worldwide. “That same market opportunity exists globally, whether North America or Eastern Europe, and it’s a matter of getting into the marketplace and showing its viability,” Ferland says. Generating electricity through turbines in river water wasn’t part of ORPC’s initial plan, says Ferland. The focus – both from the generation market and federal regulators – was first on tidal power, prompted by a study from the Electric Power Research Institute. Paul Jacobson, ocean energy leader for EPRI, completed a similar study for the Department of Energy earlier this month, this time focused on river power resources available in the continental United States. “There’s a meaningful resource there that can be captured,” Jacobson says. ORPC estimates that its RivGen system could, someday, provide 10% of the energy needed in rural areas of Alaska, according to its application to the state’s energy agency. Nationwide, the company says the technology could contribute to coastal power grids as well as off-grid coastal, island and riverside communities. The company earlier this month received the “Emerging Company of the Year” award by the New England Clean Energy Council. Gathering information from the Cobscook Bay project has been central to ORPC’s development of its turbine systems, including installation methods, maintenance routines and working with a community around a big energy project. The biggest breakthrough for the Cobscook Bay project, Jacobson says, is the 20-year power purchasing agreement the state’s Public Utilities Commission approved with Bangor Hydro Electric, Central Maine Power Co. and Maine Public Service that allows the project to expand its capacity up to 5 megawatts, enough to power around 1,200 homes. Under that agreement, power comes in at 21.5 cents per kilowatt-hour for the first year, which is eight cents above the local average and nearly double the state’s average price. That, notes Ferland, reflects the emerging technology at its most expensive. By 2020, the company hopes to bring those costs in line with traditional grid sources — achieving “grid parity” in renewable energy parlance — and Cobscook Bay is now the proving ground for that goal. Achieving grid parity depends on a wide variety of factors, Jacobson says, but the company’s cumulative experience getting projects in the water will help. To start, Jacobson says increasing reliability and reducing required maintenance are top priorities to cut costs alongside an eventual reduction in costs for environmental permitting and licensing that Jacobson says are a result of so little empirical data on how the tidal power installations behave. “Right now, there’s a high barrier of entry and everywhere you go you need two years of environmental data and have to spend a lot of money getting permitted before you have revenue,” Ferland says. The cost of installing all three turbines in Cobscook Bay (the other two turbines are expected to be installed in 2013) will be $21 million, including the costs of state and federal permitting, design, manufacture, assembly and installation. That total includes a $10 million U.S. Department of Energy grant. 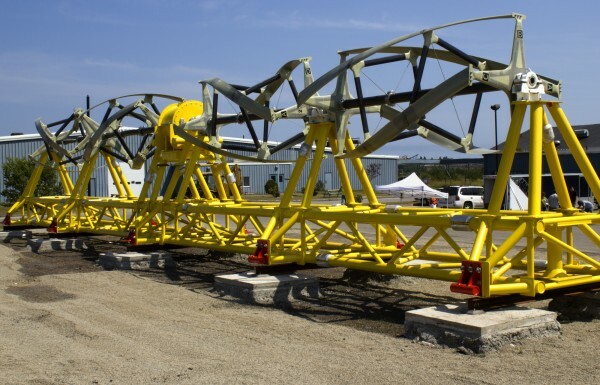 The company’s expansion into the Bay of Fundy uses a new design to tether and float 24 tidal generator units above the sea floor. That project, completing the 5-megawatt buildout, is estimated at $29 million, bringing ORPC’s total estimated costs to $50 million. Those steep development costs fuel ORPC’s strategy, which Ferland says involves some degree of experimentation, observation and interpretation. “It’s a multi-year process of a very staged tech development and a scale of operation that you can work with and then grow from,” Ferland says. The approach allows ORPC some flexibility as it dives deeper into an industry where technologies evolve rapidly and adapt to scale from, say, a tidal turbine to a river turbine. There’s a possibility the technology will continue to evolve to the point where individuals with water power access could install their own turbines. For more Mainebiz stories, visit www.mainebiz.biz.